Your home is a forever-evolving investment that you take seriously and upgrades or renovations are currently on your plate. Everyone wants to have designer finishes and luxurious items and objects to complement their basement renovation, but your basement should be the last place you spend the big bucks (as basements can be riddled with moisture issues and an overall damp feeling). Is it time to hire an expert? There are just simply far too many discount and knockoff entities/stores out there (even accessible on the Internet) for you to have to pay full price for anything luxury. You should see your basement renovation as a means to create a usable space that is more practical than luxurious. Time, weather and the materials that surround the outside of your basement will eventually cause havoc to your basement’s inner walls and the floor. This is one of the main reasons that you should steer clear of initiating high expense with materials, supplies and finishes during your luxury basement renovation. You can have a “high-end” look without the costs that come with more expensive supplies and you and your home will be far better off in the future should your basement develop a moisture issue. Expensive does not automatically mean more durable or a guarantee of a longer life. With basements, anything is susceptible to humidity or dampness. Your initial renovation materials & supplies do not have to cost you top dollar. You can go less expensive and then cover with paint for that high-end feel. 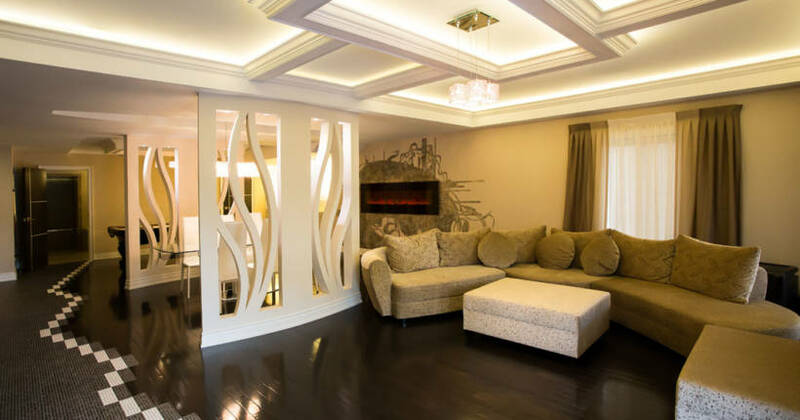 Textures and colors and the cleverness of interesting combinations of them is what can give your basement renovation that desired result without having to fork out a bundle of money. You can flip a little more money into the color palettes, pieces that will provide texture (like the flooring) and decor items. Wall and flooring materials do not have to be where you sink the bulk of your budget into. If you do your research and have a strong plan in hand, your luxury basement renovation can effectively become a huge success if you apply a strong balance between your renovation and the finishing touches. The anticipated end result should be exactly what you want to see when you enter your basement. If you’re still considering finishing your basement, hire us today for help!